After completing your Gelish nail prep, apply a thin coat of Artic Freeze, making sure to cap the free edge. Cure for 30 seconds in the 18G LED Light. Repeat for full coverage. Apply Matte Top It Off to the entire nail, again making sure to cap the free edge. Cure for 30 seconds in the 18G LED Light. With Nail Surface Cleanse and Wipe It Off lint-free wipes, cleanse the inhibition layer of the nail. Apply One Piece or Two?, Feeling Swim-sical, You’ve got Tan-gerine Lines, Limonade In The Shade, Flip Flops & Tube Tops, and Flamingo Float. Do Not Cure. Gently remove stripping tape. Apply Top It Off to the entire nail making sure to cap the free edge. Cure for 30 seconds in the 18G LED Light. With Nail Surface Cleanse and Wipe It Off lint-free wipes, cleanse the inhibition layer of the nail. Finish your look by massaging Nourish Cuticle Oil into the skin surrounding the nail plate. 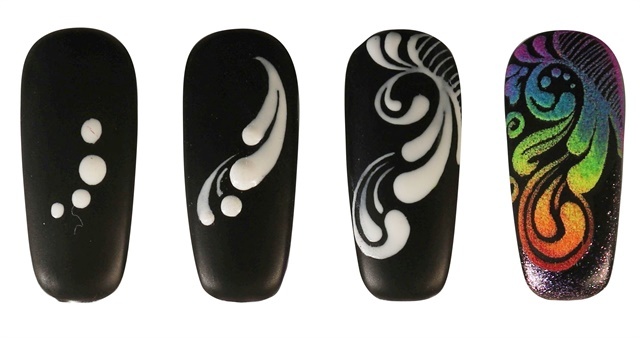 After completing your Gelish nail prep, apply a thin coat of Black Shadow, making sure to cap the free edge. Cure for 30 seconds in the 18G LED Light. Repeat for full coverage. Apply Matte Top It Off to the entire nail, again making sure to cap the free edge. With Nail Surface Cleanse and Wipe It Off lint-free wipes, cleanse the inhibition layer of the nail. With a dotting tool, apply four dots with Artic Freeze. Do not cure. With a fine point brush, drag the dots to make a paisley pattern. 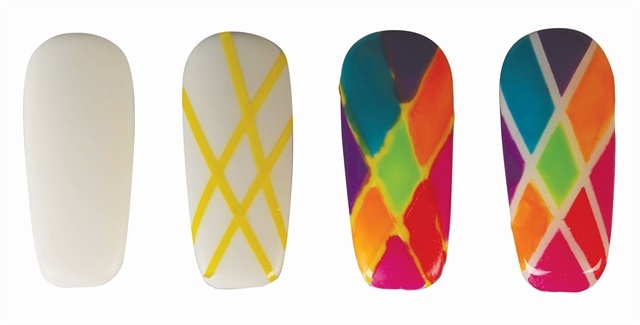 With a makeup brush, dip into your choice of Gelish Dip powders and sprinkle onto the wet uncured design. Cure for 30 seconds in the 18G LED Light. Dust off the remaining excess powder.